If you’ve been up the South Shore before, chances are you’ve stopped at Mountainside. For fifty years, this extraordinary viewpoint has lured thousands of people to pull over and enjoy in the soaring views of Lake Chelan and the Chelan-Sawtooth Mountains. There is something incredible about this spot that has beckoned people to stop their cars, get out and simply take in the scenery. Our vision was to create an oasis on this site where people could spend more time and truly connect to the inspiring Chelan glacier basin, the lake, and the North Cascade Mountains. To this end, we built two vacation getaways, perfectly positioned to capture this natural wonder. The homes are beautifully appointed, but not over-stated. We knew we couldn’t improve on what was already there. Still, you will find two gorgeous, brand-new houses – with every creature comfort – seamlessly integrated into the natural landscape. A small swimming pool perches on the hillside with expansive views over the lake. A trail meanders down to the private waterfront. There is more than an acre of grounds across the hillside for you to explore. 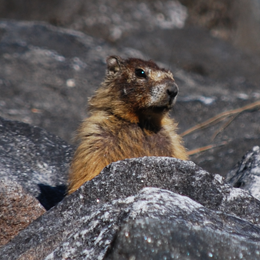 Marmots scamper on the rocks. Osprey fish right below the deck. Deer wander down the trail to the lake. This is a true wilderness experience, without the need for “roughing it.” It is a place where you can relax, unwind, and truly appreciate one of the greatest lakes in the world. All of this is just five minute from the nearest winery and 10 minutes from town. 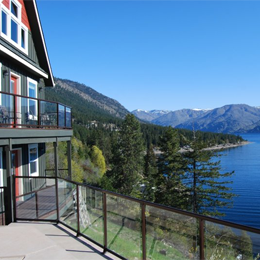 This is the Chelan experience you’ve been dreaming about, set in an incomparable location. We invite you to come and experience Lake Chelan.